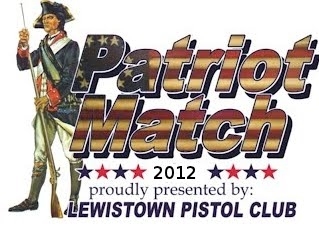 The Lewistown Pistol Club is proudly hosting the 2012 Patriot Match!! This is a sanctioned IDPA match consisting of 11 stages held on September 29 and 30, 2012. There will be one session per day and each session will be limited to 60 competitors. Registration is being handled via the NEPA IDPA scores website, and is now OPEN. Note, we do have some staff slots remaining. Staff will shoot on Friday, September 28. If you have any questions about staffing the match, ask before registering. If you're experienced staffing a major match and are interested, just mark the box for general staff or SO when you register. We would like to thank Predator Tactical for once again sponsoring the Patriot Match. Last edited by IV_Warrior; July 16th, 2012 at 10:10 PM. We would like to thank M-Pro 7 for sponsoring the 2012 Patriot Match. We'd like to thank three more sponsors. First, D-Lead signed on again this year to sponsor the match. The following two will be stage sponsors this year. The weekend of the match, September 28, 29 and 30 is Penn State’s parents weekend. Hotels are filling up quickly. We were able to secure a discounted rate at the Quality Inn, 717-248-4961 which is about 10 minutes from Lewistown Pistol club. I could not secure a discount from the Super 8 (717-242-8888), which actually has a 2 night minimum for that weekend. Competitors can obtain a double for $109+tax and a single for $99+tax. Match staff can get a double for $99+tax as they will be staying 2 nights. Rooms are going quickly so if you are planning on getting one, call NOW. We would like to thank AP Tactical and H D Peffer's Army & Navy for sponsoring the 2012 Patriot Match. We would like to thank Springfield Armory for sponsoring the Patriot Match again this year. Last edited by IV_Warrior; August 16th, 2012 at 12:51 AM. Springfield Armory's generous sponsorship includes two handguns that will be door prizes at the 2012 Patriot Match. One will be randomly given to staff and the other will be randomly given to the competitors as a door prize. Each competitor will recieve one chance to win with their entry. Additional chances can be purchased on the Saturday and Sunday of the match for $5.00 each. As of today competitors have a 1 in 86 chance of winning the handgun. We now have over 100 registered competitors. However, there is still space available for those of you who haven't yet registered. Online registration will be open for about another two weeks, or until the match reaches capacity, whichever comes first. We'd like to thank Shooters Connection for sponsoring the 2012 Patriot Match.